Hi, my dear creative friends! This is a moment I really hated to see coming - we have to say goodbye to our Creative Members... and our beautiful Gayle is one of them. I was always mesmerized by her art - so poetic, spiritual, beautiful, full of meanings. From the moment she joined our Mixed Media Place Team she never disappointed delivering the most amazing projects every time, so it was not a secret I was thrilled when she joined my own Creative Team too! Sometime later I was lucky enough to meet this beautiful soul in person and now I'm proud to call her my friend. I can't thank her enough for all she did for us - we will miss her dearly here... but soon she is joining my Brand Ambassadors so this is not a real goodbye! 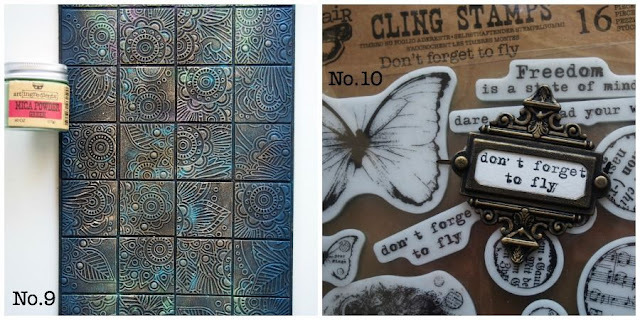 All of Gayle's stunning projects can be seen again if you will click this link! ... for a life to be exciting, we need to leave security behind and take a leap of faith into the wild blue yonder, we need to explore the unknown, and “don’t forget to fly”. Here is a step by step of how I created this. No.1 To make the background “tiles”, I firstly dry embossed onto heavy white card and then cut the card up into 1.5” squares. No.2 I adhered the squares onto a thick chipboard rectangle. 3D Gloss Gel was perfect for this - the tiles, being thick card, needed a more “heavy duty” glue to hold them down. This Gel also allows for a little “movement time”, so I was able to slide each tile into the exact position to line up perfectly before the Gel dried and set permanently. 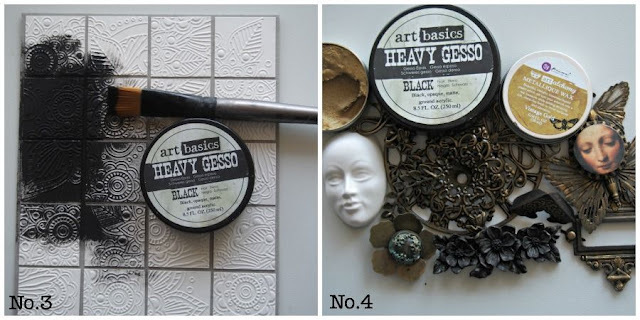 No.3 Give the tiles a coat of Heavy Black Gesso. 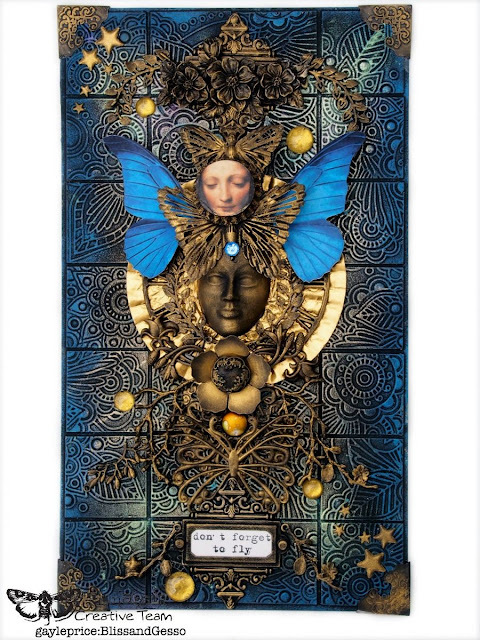 No.4 Give all the dimensional elements a coat of Heavy Black Gesso - the resin face, the beautiful Finnabair Mechanicals Butterflies, all the metal embellishments. 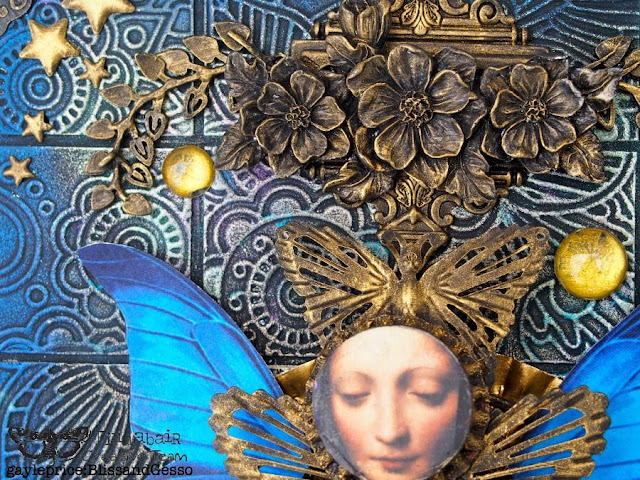 Once the Gesso has dried, use your finger to rub over everything with Art Alchemy Metallique Wax in Vintage Gold. 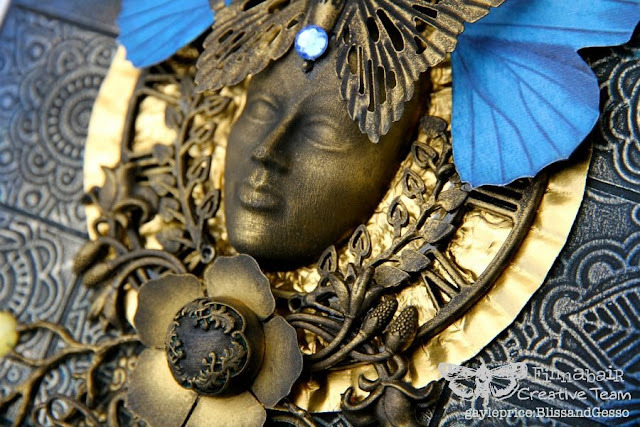 These waxes absolutely bring metal embellishments to life and make them glow. 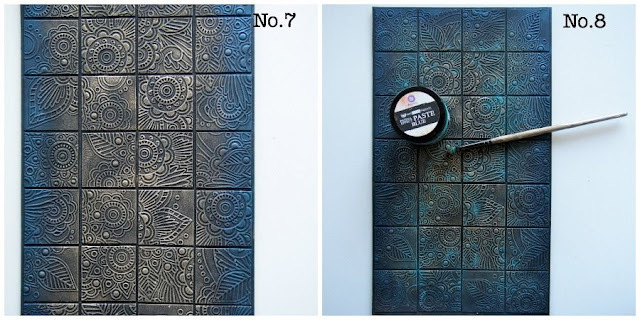 No.5 Going back to the tiled background which has a coat of Black Gesso on it, using my finger, I rub in some Art Alchemy Antique Brilliance Wax in Mystic Turquoise, just around the outside edges which creates a beautiful dark blue glow. No.6 Using Metallique Wax in White Gold, I rub over the rest of the background. 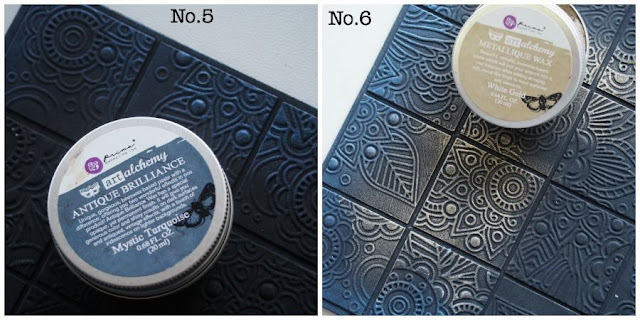 The embossed card picks up the wax on the surface and highlights the patterns beautifully. I aimed to have the centre of the rectangle lighter than the outside edge so that the dark gold dimensional elements in the centre would stand out against the lighter background. No.7 This is the background so far with Black Gesso, Antique Brilliance Wax in Mystique Turquoise around the edge and Metallique Wax in White Gold through the centre. 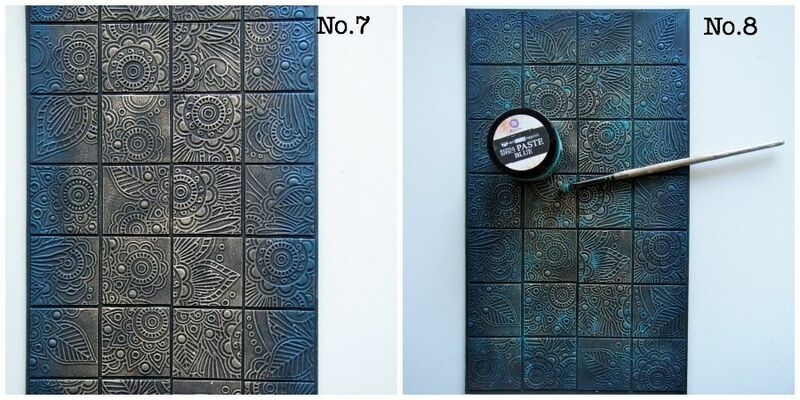 No.8 Next I dry brushed some Blue Patina Paste over the background for some extra little turquoise pops of colour. No.9 Lastly, for the background I brushed on some beautiful Green Mica Powder. It sticks to the wax surfaces and really adds a beautiful glow. No.10 Stamped out my message using Finnabair's 'Don't Forgett To Fly' cling stamp. No.11 The little gold pebbles were made using Melange Art Pebbles with their bases painted with Sparks Acrylic Paint in Dragon’s Eye. 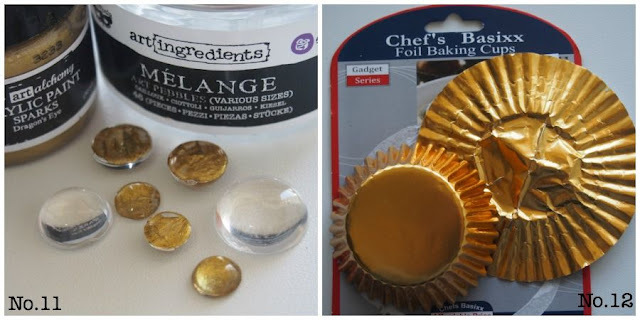 When stuck down, the gold paint radiates from underneath - so simple to do, but so effective. No.12 The gold halo around the faces comes from a foil baking cup - again, simple but effective in creating a “glow”. All the metal elements were adhered to the background using Heavy Body Gel. The combination of beautiful Art Alchemy Waxes, Sparks acrylic paints and Mica Powder create not just a “glow” but also give your project depth by highlighting dimension. As this is my last project for Finnabair’s Creative Team; my creative home for the past two years, I want to say a massive thank you to Anna and Andrew and Eliza for their encouragement and support and for giving me the opportunity to truly spread my wings and to fly. I have been so fortunate to have been a part of this team, to be given an abundance of some of the most beautiful and exciting art mediums in the world and be given free reign to do whatever my heart desires with them… so lucky and so thankful. I want also to sincerely thank all of you, lovely Finnabair friends, who have taken the time to leave for me, over the last two years, your beautiful comments. For every warm, kind and complimentary comment that you have left for me, know that it was read with absolute gratitude and that you have my genuine, sincere and heartfelt thanks. I look forward now, as I’m sure we all do, to seeing Finnabair’s new Creative Team and watching on as they spread their wings. Gayle you did it again!!! This is just fabulous.I love the tiled background and the way you treated both the backgrond and the embellishment items. You are such a talented artist and I have enjoyed so much to follow you with the DT. I will miss you ! But I hope you'll share some of your new art via your blog. 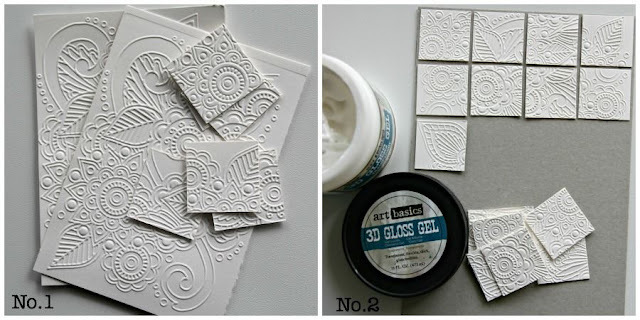 Thank you for your detailed tutorial on how you created this gorgeous last DT work. Gorgeous as always Gayle! So unique and creative! 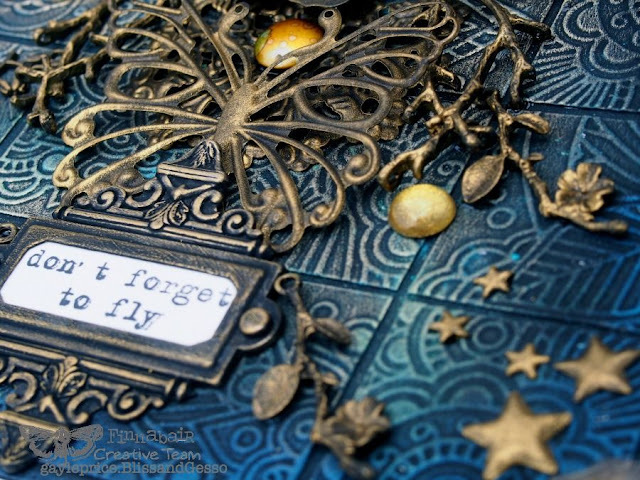 I LOVE your tiled background, Gayle, and all of the FAB details you have added! You were an inspiration to me creating for this team!